Ireland saw their RBS 6 Nations title slipping away after a 10-9 defeat to France, punished in Paris for poor scrummaging and wasting a host of half-chances. Maxime Medard's late try snatched victory, Jules Plisson landing the vital conversion as France secured their second straight win under Guy Noves. Ireland failed to fend off France's deliberate ploy of unleashing big-scrummaging props Rabah Slimani and Eddy Ben Arous from the bench and lost Mike McCarthy, Dave Kearney and Sean O'Brien to injury. Joe Schmidt's men let a second successive victory in France for the first time in 89 years slip through their fingers, unable to capitalise on early dominance and severely battered at the scrum in the second half. Captain Rory Best had promised Ireland would not be "caught cold" at the scrum as they were in last weekend's 16-16 draw with Wales. 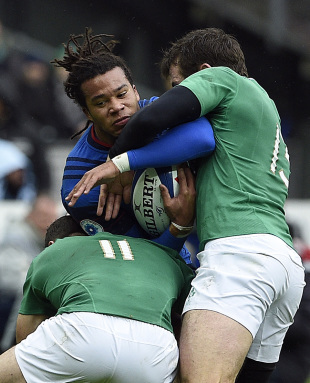 Ireland coped well enough in the first half but had no answer to France's impact front-row replacements. The visitors knew what was coming but without the injured Marty Moore, and with Cian Healy and Mike Ross still working their way back to fitness, were too depleted in the front row to cope. France bludgeoned Ireland with four successive five-metre scrums after Damien Chouly was denied a try in a defining final quarter. Once Les Bleus opted not to chase a pushover or penalty score, full-back Medard cut a neat and tight line off Plisson and scooted under the posts. Plisson posted the conversion, France led for the first time with 10 minutes to play, and they comfortably kept control until the final whistle. And so Ireland's attempt at an unprecedented third consecutive Six Nations title is most likely at an end. France are far from convincing under new boss Noves, and were certainly vulnerable in a listless first half. 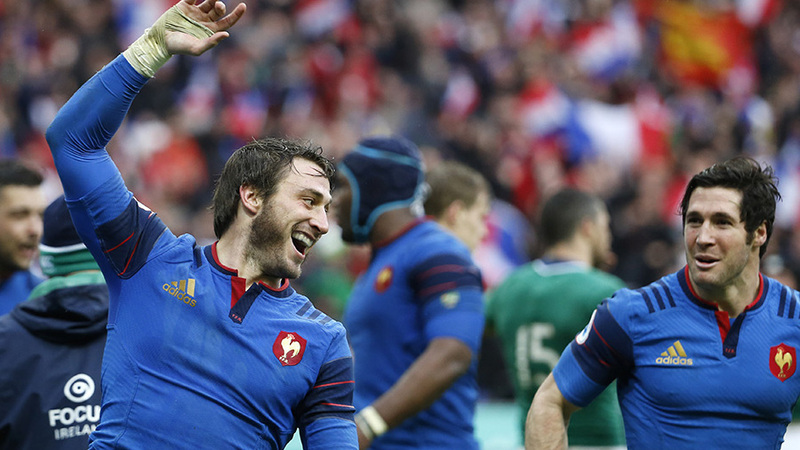 But somehow Les Bleus are now two from two, following their sterile 23-21 victory over Italy in their first game. Ireland will be left to count the injury toll once again, O'Brien appearing to suffer a serious knee problem while Dave Kearney picked up a nasty shoulder injury. Mike McCarthy was removed from the field on a stretcher in a neck brace after a head collision with team-mate Jack McGrath, and Sexton was withdrawn late on with a potential head injury. Sexton's three penalties had proved scant reward for Ireland's first-half dominance, which later crumbled so spectacularly. Lock Paul Jedrasiak vowed Les Bleus would "bleed for the shirt" in advance, and France set about rough-house tactics at every turn from the outset. Yoann Maestri's shoulder-first ruck clear-out on Sexton and Guilhem Guirado's late, high tackle on Dave Kearney could well interest the tournament's citing commissioners next week. Referee Jaco Peyper was happy to let both go with little censure, Maestri only penalised and Guirado escaping any punishment. Ireland wasted at least five tangible try-scoring chances in a sloppy first half but turned around 9-3 ahead thanks to Sexton's boot. First they lost a lineout in Les Bleus' 22 before Robbie Henshaw knocked on deep in French territory. Rob Kearney was turned over at a ruck, and then Jared Payne wasted a fine chance by refusing to set Andrew Trimble down the right flank. O'Brien was penalised for holding on before trudging out of the action and then Ireland spilled the ball five metres from France's line. Plisson struck France's sole penalty of the first half, failing with another attempt off the tee and also with a shanked drop-goal effort but converting when it mattered late on.